What's the best way to try cosmetics? If it's FREE! 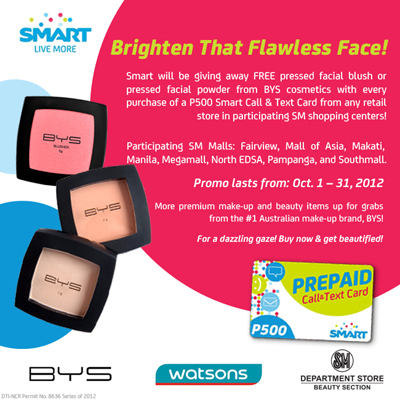 SMART has a new promo called SMART's BYS Cosmetics Promo. For any purchase of a Php500.00 Smart Call & Text card from any retail store in participating SM Shopping Centers (Fairview, Mall of Asia, Makati, Manila. Megamall, North Edsa, Pampanga and Southmall). You may get free make up and beauty items from BYS Cosmetics! Get a FREE lipstick or lipgloss amounting to P199 to P229 when you purchase Smart Call and Text Card P500 from October 1 - 7, 2012. Get a FREE eyeliner amounting to P169 when you purchase Smart Call and Text Card P500 from October 8-14, 2012. Get a FREE pressed blush or pressed powder amounting to P229 to P249 when you purchase Smart Call and Text Card P500 from October 15-21, 2012. Get a FREE nail polish amounting to P199 when you purchase Smart Call and Text Card P500 from October 22-31, 2012. Please refer to this LINK to learn more about the promo. Happy SMART Card and BYS Cosmetics shopping!